Find something you’re passionate about and stick with it! That’s the advice Ed Gayagas has followed for himself and the message he passes along to others. Ed lives on O‘ahu with his wife Norma and for as long as he can remember his passion has been martial arts. Growing up on Kaua‘i, Ed was a scrawny kid who avoided fights but once, when confronted by a bully, Ed decided “enough is enough” and started turning his life around with judo, jujitsu and taekwondo and the meditation practices those disciplines offer. He also found a love for the military and began a 30-year career with the Army that lasted until he retired in 1989. 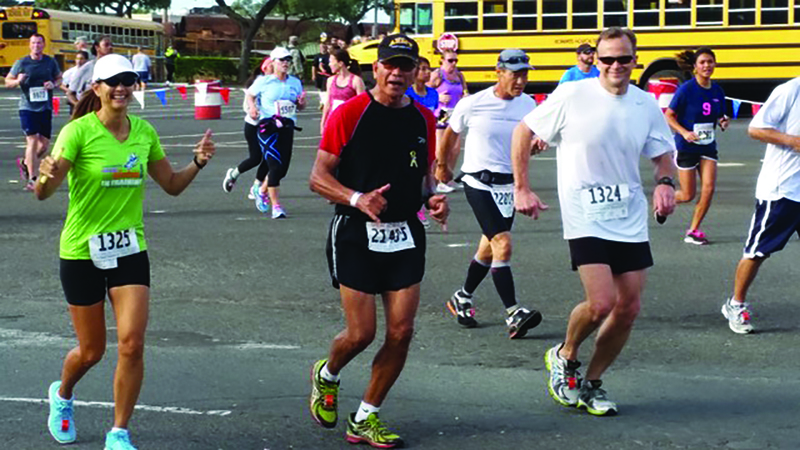 Ed is now 79 and among his other accomplishments has participated in the Great Aloha Run every year since its inception in 1985. That perfect attendance record was nearly shattered last year, however, when Ed fell ill with a rare form of brain cancer, primary central nervous system lymphoma. Doctors at both Tripler and Queen’s confirmed the diagnosis and gave Ed only a four percent chance of survival if the inoperable tumor went untreated. So, Ed began months of chemotherapy that zapped him of his strength and energy. But with the help of an early morning routine of exercise, meditation and deep breathing, along with a strong desire to compete again, Ed was able to cope with the chemo treatments. When they were over, Ed’s strength returned, and he now plans to run again for real. In last year’s Great Aloha Run, Ed was unable to run the entire distance but ran as much as he could, then got in a wheelchair and was pushed along until he felt he had recovered enough to run some more. It took about three hours, but Ed was able to finish the race and chalk up another year. Ed is relentless in his pursuit to be healthy and fit but other aspects of his life are no different than any other man of his age. In matters of diet, Ed tries to eat lots of vegetables but says he’s no vegetarian. “Steak is my favorite, aside from sweets,” Ed admits. As for his meditation practices, Ed says he doesn’t subscribe to one specific type of meditation — but rather has cherry-picked aspects of different philosophies that work for him. He encourages others to develop their own “style” — not only of meditation but also of exercise. When asked if he ever thought that he would be diagnosed with a life-threatening disease, he replied emphatically, “No!” He always assumed he would be on a healthy path and always strove for optimum health. “Don’t give up!” Ed repeatedly advises. Advice that is certainly working for him.